Many of our clients look have asked us for advice in an analog solution. With hundreds of products on the market, we wanted to be selective with which products to offer. The standards would remain the same - high sonic performance, excellent build quality, and great value among its peers. While the turntable itself is an extremely important foundation of any analog system, and the multitude of cartridges available for the asking, the importance of the tonearm is often overlooked. We feel that a great tonearm can elevate less expensive cartridges to stunning performers. 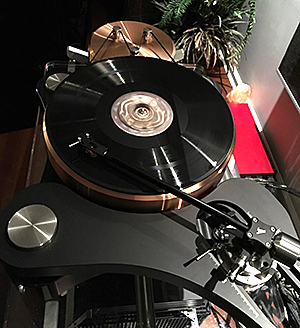 We offer several additional reference tonearms that will perform in stellar fashion when married to the right table and cartridge - leaving those choices to the individual's fancy. A dynamically full balanced pivot tonearm which finally takes into account all geometrical aspects, all the various inherent forces and combines all solutions in a most consequent way. Thus the very best performance possible for any given cartridge is enabled. State-of-the-art materials - combined with high-tech production and finishing methods and unique solutions - an idea is transformed into a fascinating analog component. * all parts of the AXIOM - even the screws, the inner wiring and it's customized aluminum transport case are made in Germany. The THALES STATEMENT confirms again the unchallenged reference status of analogue music reproduction. It proves experience, thorough reflection, and careful craftwork to be able to achieve considerable progress in sound quality with this 130-year-old technology even today. In order to surpass their in-house reference products they had to combine tried and tested solutions with completely fresh approaches. Introducing ... the AQUILAR - the all-new 10” & 12" reference tonearm. 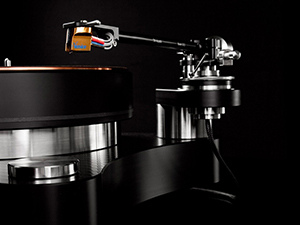 Immediately audible outperforming all other tonearms except the AXIOM offers many of the prime choice and expensive materials, as well as most of the unique technical key solutions which made the AXIOM's performance easily standing heads above all competition. Built after the Reed Mag prototype tonearm, the Reed 3P is the latest tonearm model replacing the current Reed 2P. As the latest addition to our 3rd class of tonearms, it will not only have fine VTA adjustment on-the-fly, but also the unique ability to adjust azimuth while playing a record. An exciting thing about the azimuth adjuster is that during the adjustment process, the cartridge "swings" around the needle tip, hence keeping all other tonearm parameters intact. Another innovation of the 3P is its bearing system. 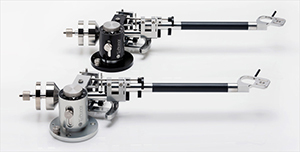 Although tonearm bearing systems can be considered gimbal, it acts like a unipivot one. However, a major difference of a unipivot system is that instead of a single pivot, three pivots and both vertical and horizontal axis' magnetic stabilizers are used. Such a bearing system is as rigid as gimbal, but its friction coefficient is as low as in unipivot. 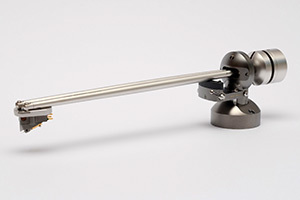 The Reed 3P Tonearm is available in 9.5", 10.5", and 12" Armwands, in several select exotics wood finishes, internal wiring options as well as several exterior metal colors. On Demo. Click her eyes to make an appointment. 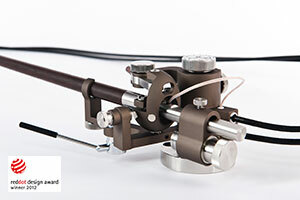 Reed 2G is tonearm model, which merges the best features of Reed 2A and Reed 3Q tonearms and adds a few new ones. The Reed 2G is very easily adjusted and can be mounted to virtually any turntable with or without an adapter. As other our tonearms, Reed 2G features 0.2 mm precision VTA adjustment and tonearm’s height can be adjusted from 28 mm to 48 mm.Tonearm has cardanic bearing system: vertical axis has thrust rotation bearings and horizontal axis is based on thrust pivot bearings (a bit close to Reed 3P). Such bearing construction eliminates bearing wobbling, which has a great impact to the quality of the sound. 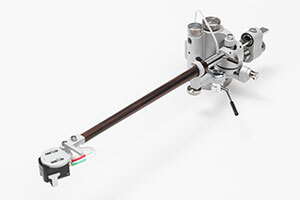 All Reed 2G tonearms have unique azimuth adjustment system, which allows implementing a tonearm with replaceable armwand. Replaceable armwand feature allows you to change tonearm effective length and effective mass with no hassle. For connecting the armwand and tonearm body, high quality LEMO connector is used. After researching and investigating lots of tonearm designs, both available currently or made years ago, we discovered that majority of popular tonearm bearing systems are not optimal for a tonearm from mechanical and acoustical point of view. That’s why we designed and built our newest Reed 1X tonearm with a bearing system, which differs substantially from the most of tonearms available in the market. We think that it is an optimal mechanical system that ensures flawless reproduction of vinyl record. 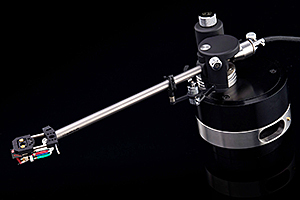 The THALES SIMPLICITY II sets the benchmark for what is possible in tonearm-design today. The tracking geometry is based on a unique tetragon solution that reduces the tracking-error to 0,006 degrees. Our new TTF-bearing-technology makes sure the performance achieves a level never reached before, as the micro-ball-bearings are arranged in a tension-free setup. The intrinsic frequencies of the two tonearm tubes are carefully tuned to improve on the damping properties of any single arm tube design. 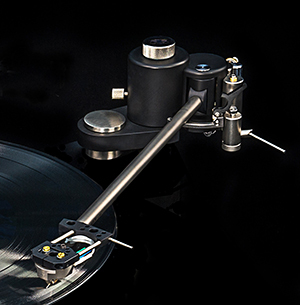 The Tri-Planar Ultimate Mark VII tonearm creates a musical sound stage unmatched by any other. The unique dual-pivot design of this precision tonearm provides unrivaled tracking, transparency, and resolution. It has been described as powerful and dynamic, solid yet expressive, delicate and tactile. The Tri-Planar Ultimate Mk. VII has outstanding quality, and is invisible, lacking the colorations that plague many of its competitors. The unique dual-pivot design of this precision tonearm provides unrivaled tracking, transparency, and resolution. The arm creates a musical sound stage unmatched by any other. It has been described as powerful and dynamic, solid yet expressive, delicate and tactile. Terminations: 1 Meter (39 inches) direct RCA or XLR; 25 centimeters (10 inches) to Box Output F RCA; 15 centimeters (7 inches) to DIN Cardas connector. The arm is available in Silver or Black Finishes. All of the above with the inclusion of a carbon fiber arm tube and silver internal wiring. See the video on AVShowrooms.